When we are in the woods, fields, or river’s edge we can see home sites for small animals everywhere. Note the small root-draped overhang and it's shadow at the top right of photo. Below the overhang is a small trail, possible used by a deer-mouse or other denizens of this neighborhood. The dark green leaves and bare stems of the shrub (an American Holly) a little lower in this photo houses aphids, a wide variety of insects, and an occasional spider, mostly restricted to this arboreal habitat; a close look reveals a small but thriving community. Note the largest tree trunk to the left. Any variation in the surface structure provides a new hiding place for tiny creatures. At the junction of a branch form this trunk there is a v-shaped angle above that holds rain water better than the smoother angle directly below the junction of the branch. These are two different tiny habitats, and yes, some little animals, such as ants, will benefit from the moisture held in the top angle that is not present at the lower part of the junctions. And there are few larger animals, such as beetles, true bugs, moths, flies and even birds, maybe a lizard, and spiders on this larger trunk that might now inhabit the smaller twigs and leaves of the Holly. The bare path at this level is sandy and home to an entirely different community, some on the surface, some under leaves or twigs and some that burrow in the soil. Around the base of the tree, the Holly, and the dead log there probably exists the most complex community visible in this photo. 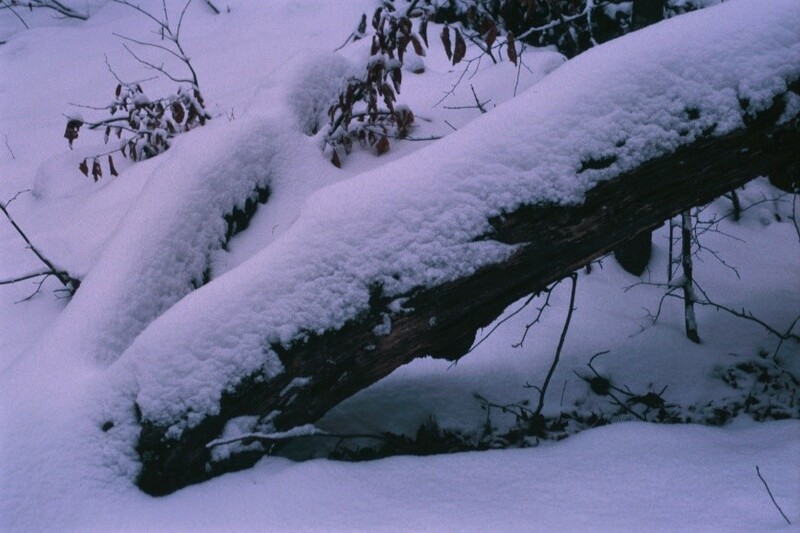 This area contains more nutrients from the decomposition of the plant and animal material on the ground and under the log than any of the above, arboreal, habitats. Also, the log and leaf litter hold moisture much better than any place above ground and therefore supports a much larger community of small animals including larger invertebrates, possible a mouse, shrew, lizard for small snake inside the log. Wood-boring beetles, larvae, fungi, earthworks, snails, termite, slugs, moss or even a slime mold could be part of this community. This little ecosystem in the photo is on the OMBS but is not limited to the OMBS. Email lhardy@lsus.edu or call 318-797-5338 for more information. If you are interested in bringing a class or other group, check our calendar for overnight availability. We have a total of 21 beds in addition to camping or tent areas. Enjoy nature. Biology in the dead of winter is always a somewhat depressing thought to a biologist from a temperate environment. During winter the cold seems to overpower our thoughts about biology. Snow, ice, and a blowing, frigid, wind is usually enough to turn off any biologists’ dreams of a furry, warm, mouse family or basking lizards. However, in the woods and mountain ridges of the OMBS there is hope for such an interesting mid-winter scene. Winter at the OMBS is cold, often wet, and bleak (but interspersed with sunny days). Under the logs, stones, and leaf litter is a layer of soil, rotting leaf litter, and detritus which harbors a community of living organisms that continue to thrive during “dead” of winter. As expected, temperature is the main environmental variable that affects these living organisms. Something that is possibly less expected is that the temperature under even thin leaf litter at the OMBS rarely, if ever, drops to freezing. So, that leaf litter environment is very well-protected from freezing, thus removing one of the more important environmental limits for the leaf litter-to-soil biotic community. Much remains to be discovered about these organisms. How do the animals change their habits, diet, behavior, loss due to predation, growth rates, etc. during mid-winter? However, that question, “how do they change?” might be making a premature assumption. A more basic question might be “do they change?” My recent study of a species of trap-door spider indicated that their behavior and seasonal routine might not be any different in winter as it is during warmer times of the year. 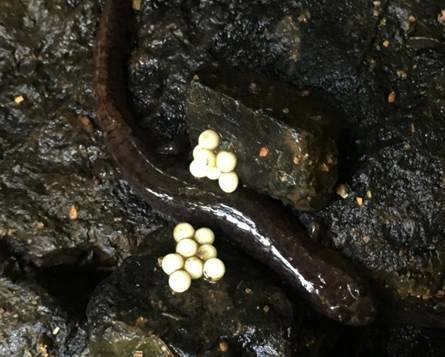 For many species of insects, spiders, earthworms, other invertebrates, salamanders, snakes, mice, and others there could be significant changes in population dynamics during mid-winter that have yet to be documented – but are there? Many studies have documented mid-winter dormancy in organisms that do not have the ability to internally regulate their body temperature; for example, spiders that over-winter in an exposed web, insects in cocoons, and organisms in aquatic habitats. It is appropriate, and over-due, to determine which animals in this specialized environment (leaf litter-to-soil) actually undergo seasonal changes in their habits. For many years we (the staff and volunteers of the OMBS) have been monitoring the presence and activity of many animals found at the OMBS. Black Bears, Gray Foxes, Coyotes, Bobcats, Raccoons, Opossums, Gray Squirrels, chipmunks, mice, and many other of the interesting animals found here have been photographed using several motion-activated game cameras. While we have assembled much useful scientific information regarding the biota of the OMBS, we have also enjoyed some interesting and somewhat humorous events. One such event involved a recent video of a Spotted Skunk which requires some explanation before it is viewed. A can of sardines was attached to a tree by a small creek. On the night in question a Gray Fox had apparently approached the sardine bait, which must have been the prized possession of the neighborhood Spotted Skunk. When the video starts there is in the upper-right margin of the screen an elongated shape that immediately moves out of view to the right. [That shape, upon careful examination of stopped images of the video, was an adult Gray Fox.] In the center of the view is a tree and the tail of a Spotted Skunk. The skunk moves around the tree (to the right and momentarily out of sight) and then up the far bank of the stream and gallops after the fox. We do not know what the skunk had in mind nor what was going through the mind of the escaping (?) fox! Double-click the attached video for your own amusement, interest, or philosophical analysis. Spotted Skunks are very rare and secretive. Many studies over the past century have identified some consistencies in their ecological and biogeographical characteristics. Normally, they 1) are nocturnal (active only at night) and never diurnal (active in daytime) or even crepuscular (active at dusk or very early morning); 2) spend non-active times in burrows, hollow logs or other secure cavities; 3) prefer thick, thorny, tangles of vines and bushes for their secretive retreat, 4) avoid open spaces. If you are interested in bringing a class or other group to OMBS, check our calendar for overnight availability; we have a total of 19 beds available, not counting camping or tents. . Extreme changes in weather conditions can trigger unusual environmental changes. Ice storms can increase the number of fallen trees – uprooted trees open the ground and exposes new earth surface in the ground and on the earth ball of the tree and these changes will affect the communities of organisms in the immediate vicinity of the tree fall. Population changes will oscillate up or down accordingly and such changes are rarely documented with scientific data. Which species experience positive population changes (that may increase their adaptive strength) and which species experience negative population changes (that may decrease their adaptive strength)? These changes will have a domino effect on adjacent populations and sympatric species. How far can the effect be documented from the epicenter of the environmental disturbance? Data that pertains to these changes are needed to confirm that such changes even exist – or not. Biological stations, such as the OMBS, are ideal sites for such studies because of their long-term existence and relative protection from man-made changes that must be isolated from natural ecological effects. While fluctuations in the well-known, common species can be relatively easily documented, it might be the possible losses of the more poorly known species of biological communities that can initiate a cascading effect on an ecosystem. It might be obvious to many biologists that dramatic species fluctuations occur and that those fluctuations will affect communities. However, it might not be so obvious as to the impact on larger taxonomic units – which families are impacted? Are some families more vulnerable than others? Can we predict the eminent local extinction of one species or family (or other group) over another? Many research projects for both students and faculty can be developed from the above ideas. If you are interested in bringing a class or other group to the OMBS, check our calendar for overnight availability; we have a total of 19 beds available, not counting camping or tents. Importance: Old-growth forests often contain rich communities of plants and animals within the habitat due to the long period of forest stability. These varied and sometimes rare species may depend on the unique environmental conditions created by these forests. 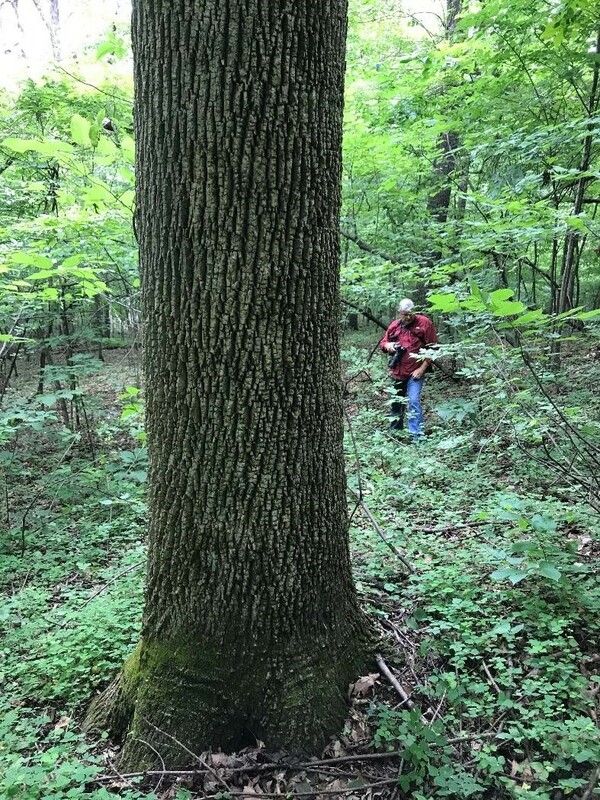 Old-growth forest serves as a reservoir for species which cannot thrive or easily regenerate in younger forest, so can be used as a baseline for research. Plant species that are native to old-growth forests may someday prove to be invaluable towards curing various human ailments, as has been realized in numerous plants in tropical rainforests. Old-growth forests also store large amounts of carbon above and below the ground (either as humus, or in wet soils as peat). They collectively represent a very significant store of carbon. Destruction of these forests releases this carbon as greenhouse gases, and may increase the risk of global climate change. Ecosystem services: Old-growth forests provide ecosystem services that may be far more important to society than their use as a source of raw materials. These services include making breathable air, making pure water, carbon storage, regeneration of nutrients, maintenance of soils, pest control by insectivorous bats and insects, micro- and macro-climate control, and the storage of a wide variety of genes. Climatic impacts: Old-growth forests are often perceived to be in equilibrium or in a state of decay. However, evidence from analysis of carbon stored above ground and in the soil has shown old-growth forests are more productive at storing carbon than younger forests. Forest harvesting has little or no effect on the amount of carbon stored in the soil, but other research suggests older forests that have trees of many ages, multiple layers, and little disturbance have the highest capacities for carbon storage. As trees grow, they remove carbon from the atmosphere, and protecting these pools of carbon prevents emissions into the atmosphere. Proponents of harvesting the forest argue the carbon stored in wood is available for use as biomass energy (displacing fossil fuel use), although using biomass as a fuel produces air pollution in the form of carbon monoxide, nitrogen oxides, volatile organic compounds, particulates, and other pollutants, in some cases at levels above those from traditional fuel sources such as coal or natural gas. Role of OMBS: While OMBS does not have an old growth forest we do have several of the characteristics of one. We hope that the future of OMBS will include the preservation and protection of any old growth forest that we can sustain as an example of the once great forests that grew in the Ouachita Mountains long ago. There are many interesting biological research projects that can be done on the OMBS. The following list contains a few examples of projects, any of which could lead to a publication in a scientific journal. There are many more. Compare the ecology of two species of walking stick insects, diversity of ants, feeding habits of trapdoor spiders, nesting biology of Louisiana Waterthrush, population ecology of buckeyes, population density of the trapdoor spider Ummidia, winter ecology of flying squirrels, species diversity of moths, winter bird community structure, chipmunk ecology, earthworm diversity, phosphorescent invertebrates, mushroom diversity and abundance, lichen diversity, population ecology of the snake genus Virginia, tree species used for food by Yellow-bellied Sapsuckers, fish diversity in the creeks, population structure of freshwater mussels, where do Eurycea overwinter, habitat of Hemidactylium, community structure of daddy longlegs, biotic community using hollow trees, population structure of three species of the spider genus Micrathena, gastropods of the Ouachitas, population biology of scorpions, biology of Cerulean Warblers, habitat characteristics of mountain populations of salamanders, diversity of centipedes, grasshopper diversity, dirversity of beetles, ecology of stoneflies, seasonal abundance of bats, comparative rabbit ecology, demography of fence lizards, home range of timber rattlesnakes, rodent diversity, seasonal abundance of fireflies, habitat characteristics and diversity of deer mice (Peromyscus), breeding bird diversity, demography of paper wasps in the forest, habitat of the shrew, Cryptotis parva, diversity of millipedes, population dynamics of moles, diversity of butterflies, the community of hole-nesters, habitat of the Golden Mouse, community ecology of snakes of the genus Storeria, pseudoscorpions of the Ouachitas, diversity of the Homoptera, diversity of terrestrial snails, distribution of American Basswood, demography of Ambystoma maculatum, ecology of tarantulas, abundance of Eastern Screech-Owls, community composition of oak trees (Quercus), diversity of jumping spiders(Salticidae), diversity of slime molds, population dynamics of flying squirrels, diversity of tardigrades, competition among woodpeckers, and many more. If you are interested in bringing a class or other group, check our calendar for overnight availability; we have a total of 19 beds available, not counting camping or tents. 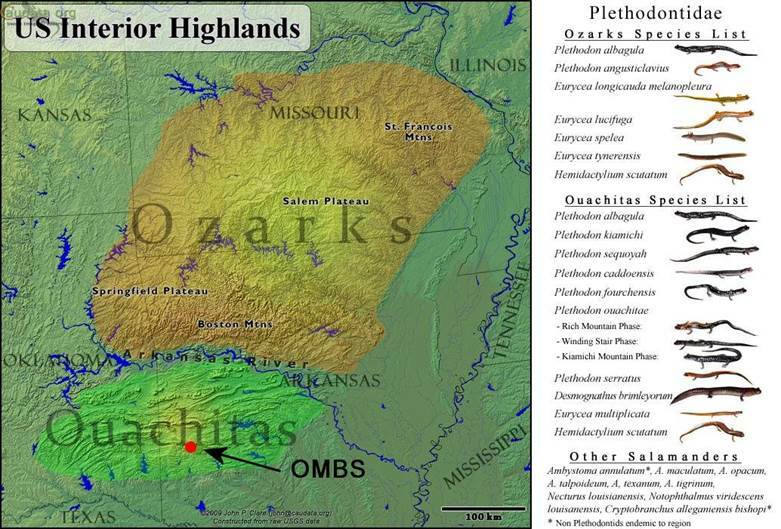 In the survey of the flora of the Ouachita Mountain Biology Station MacRoberts et. al, (2005) identified 13 species of ferns; a very small sample considering there are over 10,000 named species in the world. Ferns as a group are widely distributed across the planet though fewer in number in the deserts and colder extremes. The tropics contain the greatest diversity of ferns with growth forms including not only the typical fern morphology but also single leaved entire edged ferns, highly branched ferns, epiphytic, climbing, vine-like, and tree ferns. The branching of the fronds may be simple and entire, to bipinnate-pinnatifid, thereby exhibiting a wide diversity in frond morphology. On a hike along West Cabin Trail one can encounter several species so let's take a hike. As you walk from Nuthatch to the shop and are under the powerline look to your left and there you will see the Brachen Fern, Pteridium aquilinum. 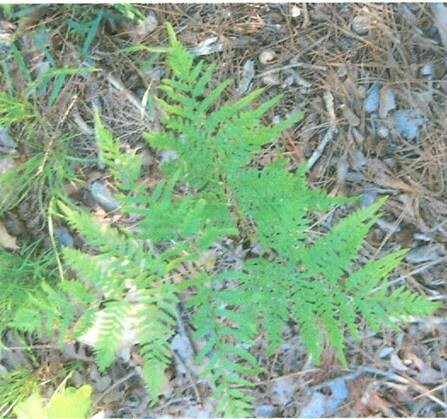 The Brachen Fern is quite tolerant of warmer drier habitats and does well in the open sunlight. It may be found along roadways, on open slopes, in open fields, as well as in the forest where there is considerable sunlight. The Brachen Fern is rarely used as an ornimental because of its wide spreading habit and its tendency to spread by wide creaping rhizomes. 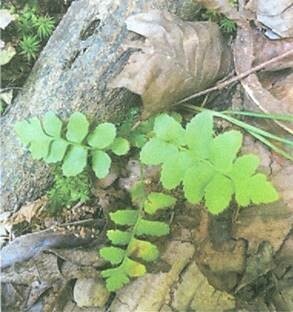 It is said that a tea made of the Brachen Fern is good for worms. I don't know if this means it is good for worms or for getting rid of worms. Brachen Fern is one of ten species, including the uncommon Blunt-lobed Woodsia, that have been documented at the OMBS by Dr. McPherson. Blunt-lobed Woodsia at the OMBS. The discussion above and the photographs are from a trail guide for the Fern Trail at the OMBS written by Dr. Brad McPherson. Brachen Fern is one of ten species, including the uncommon Blunt-lobed Woodsia, that have been documented at the OMBS by Dr. McPherson. How many more species of ferns will be discovered as we explore remote creeks and springs? The above photograph is of an adult female, Myrmekiaphila tigris from Bond, et al., 2012 (ZooKeys, 190:95-109), closely related to Myrmekiaphila comstocki. 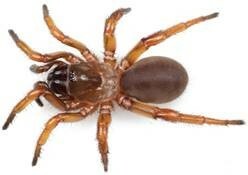 For many years, while doing routine biological surveys at the Ouachita Mountains Biological Station (OMBS), I was studying one species of trapdoor spider, Myrmekiaphila comstocki (Cyrtaucheniidae). This species is the only one, of the 10-12 species in the genus, that is distributed west of the Mississippi River. These spiders are tarantula relatives and range in size up to about an inch in length. This species constructs burrows with a trapdoor at the entrance, is active in all seasons, and is common at the OMBS. Another genus, Ummidia (Ctenizidae) has been documented at the OMBS but it appears to be uncommon. The common tarantula of the area, Aphonopelma (Theraphosidae) has also been documented but is very rare at the OMBS. However, the Purseweb spider, Sphodros rufipes, is expected in this area and in this habitat but it has never been found, in spite of the conspicuous nature of their tube-shaped webs on tree trunks. Much biodiversity is yet to be discovered. Over several years I studied many aspects of the natural history of our common trapdoor spider, Myrmekiaphila comstocki. Females construct the characteristic burrows in which they live for their entire lives; however, the rarely encountered males live elsewhere and are only found when they are wandering on the forest floor. There is much information about the biology of this species that we do not know; therefore, there is a wide variety of basic research projects waiting to be solved by interested biologists (students or faculty). What do they eat and what eats them? Do the females move to a new burrow (and why)? What does the female do with excavated soil? When are eggs laid? Are the eggs in a cocoon? When do the young emerge from the burrow? Do the young balloon? Where do the males reside? When do they wander? Do the males prefer the same habitat (or microhabitat) as do the females? The Wallace Lake Biological Station (WLBS) is now a part of the OMBS and is located on the edge of Wallace Lake in DeSoto Parish, Louisiana. The WLBS covers about 600 acres consisting of upland pine/oak forest and lowland cypress/button bush swamp on the south edge of Wallace Lake, a U.S. Corps of Engineers flood control structure. This facility, located just a few miles south of Shreveport, has about a mile of trails and about a half-mile of shoreline, but no other development. Directions to the WLBS can be found here. Future plans include an education/visitor center, parking area, and a boat dock on the lake. The acreage (even though surrounded by residential property, farmland, and petroleum production wells) contains White-tailed Deer, Wild Turkeys, and many of the amphibians, reptiles, birds, and mammals expected in the diverse habitat. No biological surveys have been done so nothing has been documented regarding vascular plants or any invertebrate animals. The physical position of the WLBS can be of biological importance because it is essentially an island ecosystem surrounded by human development. The possibilities for research are great. Contact the OMBS (see below) for more information or to visit the WLBS. This satellite map shows the two parts of the WLBS, north and south, outlined in red. The habitat photo at right is near the main entrance. Four species of Shrews might reside on the Ouachita Mountains Biological Station. One, our logo/mascot animal, is the Southeastern Shrew (Sorex longirostris, upper left) which was found in 1970 in a pitfall trap (note long tail and nose); none other of that species has ever been found on OMBS. The only other shrew known from the OMBS is the short-tailed Shrew (Blarina carolinensis, upper right) . Note short tail, which seems to be common. However, two other species should be here. The Least Shrew (Cryptotis parva, lower left)- note short tail and tiny ears- is of common occurrence throughout the southeastern U.S. but has never been recorded from the OMBS. That species is tiny, secretive, and probably does not leave the security of hollow logs, stumps, crevices, or subterranean burrows, and is usually associated with fields and edge habitats. Another species, the Desert Shrew (Notiosorex crawfordi, lower right) , - note long tail and big ears- is a western species that is known from Arkansas and possibly is in the Ouachita Mountains, which extends from western Oklahoma to central Arkansas. The photo of Notiosorex is by Laurence M. Hardy; the other three are from Arkansas Mammals, 1990, by John A. Sealander and Gary A. Heidt. So, the shrew community known from the OMBS could be at least twice as diverse as the available data shows. Two species are known from the OMBS and two others might be here. If the Least Shrew is not on the OMBS – why not? That fact, impossible to prove) would raise several very important ecological questions regarding the required habitat, food, biological barriers, etc. The Desert Shrew is perhaps less of a question. The OMBS would be on the eastern edge of its geographic distribution and it might prefer more rocky and arid habitat; therefore, we might have some suitable habitat in upland areas. If it is here it probably has a very low population density. For more information, directions, and facilities please see our web site: www.theombs.org. If you are interested in bringing a class or other group, check our calendar for overnight availability (http://calendar.yahoo.com/ombs615); we have a total of 17 beds available, not counting camping or tents. The Ouachita Dusky Salamander (Desmognathus brimleyorum) is probably the most abundant salamander in all of the creeks on the Ouachita Mountains Biological Station. These photos were taken August 12, 2016 on the edge of the permanent creek near the office of OMBS (quad A1). 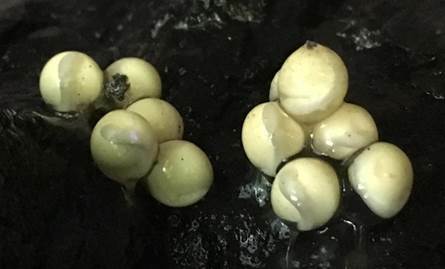 Note the embryos developing in the eggs and, in the photo below, the two clusters are different sizes, suggesting slightly different ages for the eggs. Most of the eggs were attached to the underside of rocks in the water. During the last few years we have noticed an increase in the feeder visits by raccoons, Gray Foxes, and Black Bears. Gray Squirrels and a variety of birds are at the feeder every day. The raccoons and a fox come almost every night, usually about 11 p.m. or later, and are easy to see. Plan now to bring your class or group to the OMBS this fall. The pleasant temperatures and large variety of animals that are active and the diversity of flowering and fruiting plants makes this time of year very interesting for all visitors. 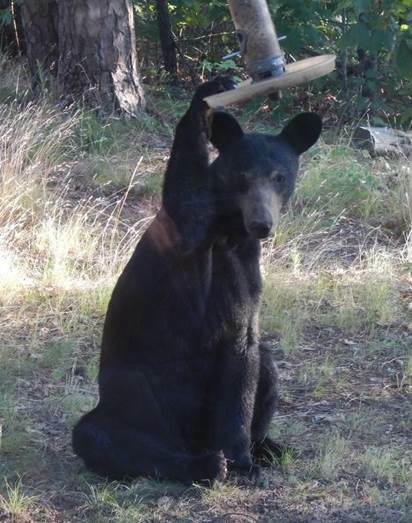 This bear, about two years old, appeared at a bird feeder on July 13th and decided that he liked bird feed. After munching awhile he sat down, obviously to rest after the heavy breakfast, but kept one paw on the feeder for several minutes, as though claiming that as his prize. He then scurried off when another person, unaware of the bear, approached from another building. The feeder was not damaged. The OMBS is surrounded by the Ouachita National Forest on three sides (some private land on the north) and has excellent access to the national forest by hiking or by road. Extensive biodiversity, with many rare taxa, and a good trail system to remote areas enhances the research potential of the OMBS for ecological, environmental, or biodiversity studies. 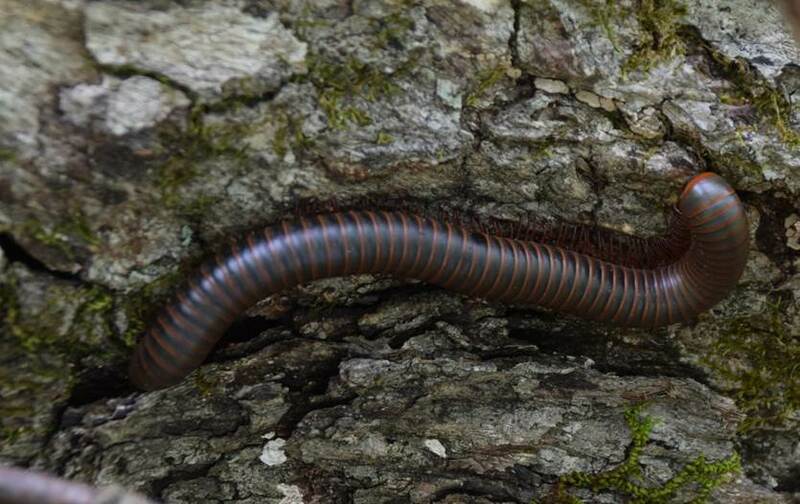 This attractive millipede (possibly Narceus americana), about 4-5 inches long, was emerging from a crack in a log on April 15, 2016. These large orange and black millipedes are common on the OMBS and are usually not bothered by predators because of the repulsive stench that the millipede exudes from the surface of its body when disturbed. They are harmless but the odor will stay on your fingers for some time. Dr. Vicki LeFevers has been monitoring moths at the Ouachita Mountains Biological Station for several years. Most of her monthly observations have been at Kingfisher (the pavilion) using ultraviolet lights to attract moths to a suitable surface (a white sheet) for photography. The two species illustrated below are examples of the reward that can result from persistence in pursuing a scientific study of biodiversity. 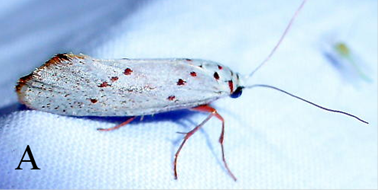 Moth A (Lactura basistriga), with its cherry-red spots and legs is a husky 10-12 mm in length. This is the first record for the Ouachita Mountains and the second for Arkansas (the only other record is in extreme NE corner of the state). 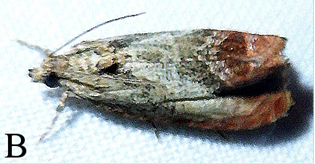 Moth B (Olethreutes hamameliana), maybe a little larger than the Lactura, is the first record of this species for Arkansas, for west of the Mississippi River, and it is widely disjunct from the nearest geographic locality in eastern Tennessee. Over the course of this study (so far) Dr. LeFevers has documented about 150 species of moths, including many rare to uncommon species. Several species of warblers are thought to nest on the Ouachita Mountains Biological Station and among those are five of particular interest – Cerulean Warbler, Ovenbird, Louisiana Waterthrush, Black-throated Green Warbler, and Swainson’s Warbler. A nest was found and accidently destroyed during brush-clearing with a weed-eater a few years ago near the office (Dogwood) that was thought to be that of an Ovenbird – it was never confirmed. The OMBS is at the southern edge of the breeding range of that species. The southwestern edge of the breeding range of the Cerulean Warbler is in the area of the OMBS and while sightings are very rare, singing of a bird in the same area on several occasions is very suggestive of nesting. The OMBS is well within the breeding range of the Louisiana Waterthrush but nesting has never been confirmed. The western edge of the breeding range of Swainson’s Warbler should include the OMBS – again, nesting has not been verified. Perhaps a more intriguing target is the Black-throated Green Warbler. This species can be heard singing almost everywhere at the OMBS and appears to be common. An isolated breeding population of this species is known just to the north of the OMBS – are our singing birds nesting or just moving through. 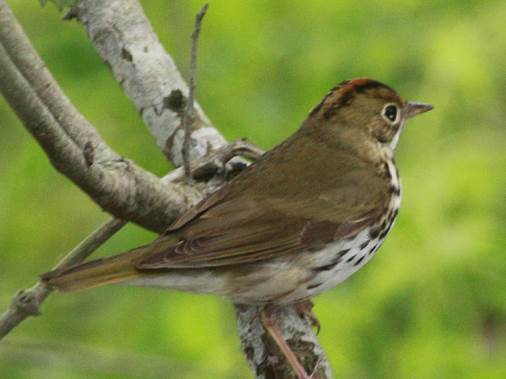 This photograph of an Ovenbird by Jeff Trahan represents one of several species of warblers that will be our target birds during a Warbler Week-end on May 27-29. The past few months have been very active at the OMBS. 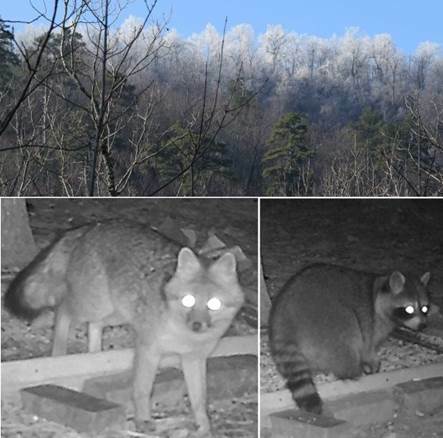 In addition to the visual treat of the icy freeze at the top of the mountain (top photo above), we also enjoyed a visit from a Gray Fox (bottom left) and a Raccoon at the bird feeder by Nuthatch. The photo of the Raccoon is the best of several photos that also show two Raccoons at the feeder at the same time and on the same night as the fox.